I am going to start this by saying outright that I’ve never been particularly fond of jalapeño jelly. Every year on Christmas Eve, my extended family gets together and we do a potluck style meal involving truckloads of appetizers. Jalapeño jelly pretty much always makes an appearance. Generally with crackers or maybe those little phyllo cups with cream cheese. I never have any. Ever. Just not my thing. But this? Could. not. stop. eating it. So addictive. I don’t know if it was the addition of pineapple, or just the fact that it was homemade, but this jalapeño pineapple jelly is so good. I’ve had it on crackers with cream cheese, and even slathered it on a turkey sandwich with dill pickles. I kind of thought that was weird as I did it, but it was awesome. I’m really glad the recipe made 6 jars, cause now we won’t be running out any time soon! Especially since the kids refuse to try anything involving spice of any kind! But this jelly isn’t even all that spicy. It has a hint of spiciness to it, but the sweetness of the jelly kind of offsets it, just leaving that bit of bite. So addictive. And you can make it spicier or milder depending on how many jalapeños you choose to seed. I seeded half of them and left the seeds in the other half, and that was perfect for us. And there’s the fun of canning! I love canning, something so lovely about the sound of all those jars popping away as they seal. That makes me sound like quite the nerd, but that’s okay. I love it, I’m not afraid to admit it. And we get lots of amazing jalapeño pineapple jelly as a result! So, any other cooking nerds out there that love canning? Or am I all alone on that one?! Note: This recipe needs liquid fruit pectin, not original fruit pectin. I tried it with the original pectin the first time and it doesn’t gel completely with that pectin. With the liquid pectin it gels perfectly. Also, I seeded 4 of the 8 jalapenos, and that was the perfect amount of spiciness for us. If you want it spicier, leave seeds in more of them, less if you want it a bit milder. With 4 seeded of the 8 it had a bit of bite to it, but not too much. In a food processor fitted with the shredding blade, or with a sharp knife, finely chop the red bell pepper, jalapenos (seeding as many as you like, I seeded 4), and the pineapple. In a large pot, combine the peppers and the pineapple with the vinegar, salt and sugar. Bring the mixture to a boil over medium heat and allow to boil for 10 minutes, stirring constantly. Add the liquid pectin and boil for 1 more minute. Remove the pot from the heat and pour into clean, hot canning jars, leaving 1/4 inch of headspace. Wipe the tops with a damp cloth to remove any stickiness and place a new lid and ring on the jar, making sure not to tighten the ring more than fingertip tight. Place the jars in a boiling water canner and process for 10 minutes, adding additional time depending on your altitude (there’s info for the amount of time to add on the pectin box, I needed to add 5 minutes). After processing, allow the jars to sit undisturbed for 24 hours for the jelly to completely set. Any jars that don’t seal, store in the refrigerator, it should last for up to a month. The sealed jars will be fine for 1-2 years on the shelf. Hi Stacey. I made this recipe today and cannot wait to try it. I LOVE Pepper Jelly! I have two quick questions for you. The first one is -- I barely had enough jelly to fill 5 half-pint containers. I'm guessing that it's because of the volume of fruit that I used? I'm guessing that my peppers were smaller than yours and maybe my pineapple was chunked bigger so there wasn't really as much pineapple? Any other ideas? And my second question, I'm new to canning. I'm fortunate enough to be picking my first crop of White Pineapples. They are 'lower in acid' than normal Gold pineapples. I would like to can enough of this to keep on the shelf. Do I need to adjust the acid in the recipe or is there enough acid in the vinegar to do the job, regardless of the acid in the fruit? Thank you for your advice AND your recipe! I haven't made this recipe in ages, hoping to make it again this year and add some volume measurements for the peppers. I'm guessing that would be the difference in how many jars you got. As far as using a different type of pineapple - if the acidity is lower I'm not sure if it would be okay. The original recipe that I adapted this from does use another red pepper and two more jalapeños, so I would think that if your white pineapple has the same acidity or higher (lower pH if you find a chart) as peppers do then you'd be fine. Golden pineapple has a lower pH then peppers so I know that that's okay to replace the peppers with as it increases the acidity of the overall recipe. Whether white pineapple is fine for this recipe I can't tell you - but you could find out the acidity of it and if it's pH is lower then 4.6 it should be fine. Hope that helps! I haven't ever tried it with canned pineapple but I think that it would be okay if you drain it first and still use 1 1/2 cups of pineapple. Not having tried it I couldn't say for sure that it would turn out the same though! Hello Stacy. How would you say the heat registers in this jelly compared to picante sauce, being mild, medium, or hot? We like ours medium to hot. I made strawberry jalapeno last year and it has been a huge hit. I can't wait to try the pineapple jalapeno. Oh that's too bad - it's so disappointing when jam/jelly doesn't set properly! I haven't made this one in a while, but I have typically found when jam doesn't gel properly for me, it's often because the pectin was old/expired so it didn't work well, there was more liquid in the batch then there should have been for the amount of pectin, or it wasn't boiled long enough. Usually I try boiling it longer to try and get it to gel before anything else. Also you should leave the lid off the pot when you're boiling - not sure if you did that or not? You can test whether it will set before you pour it into the jars and process them so you're not disappointed - just leave a metal spoon in a glass of ice water and when you have finished boiling the jelly, just scoop out a little of the boiling liquid on the cool spoon and move it out of the steam - it should gel visibly and sheet off the spoon when you tip it as it cools. If it isn't gelling on the spoon, keep boiling, testing every minute until it does. If it isn't gelling after a few tests, you might need to add more pectin (maybe your pectin is old or there's just too much liquid for some reason). Also it needs to be at a full rolling boil that you can't stir down. Hope that helps! This would be perfect with coconut shrimp! What a fun twist on jelly! I love that flavor combo! Thanks Annie! It's a pretty great combination! I love anything and everything jalapenos!! These jalapeno pineapple jelly is just genius! Perfect spicy and tangy spread.. 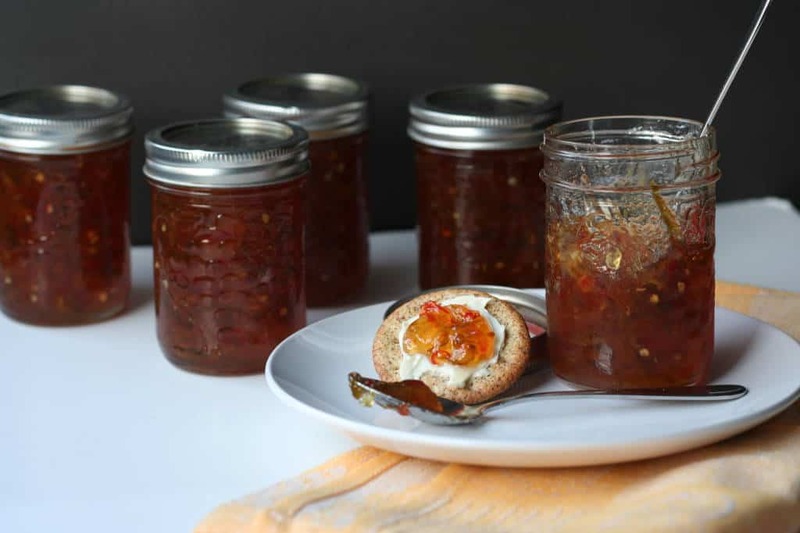 I've always wanted to make some sort of jalapeño jelly, but never found the right recipe. Planning to try this! I love the addition of pineapple as well! 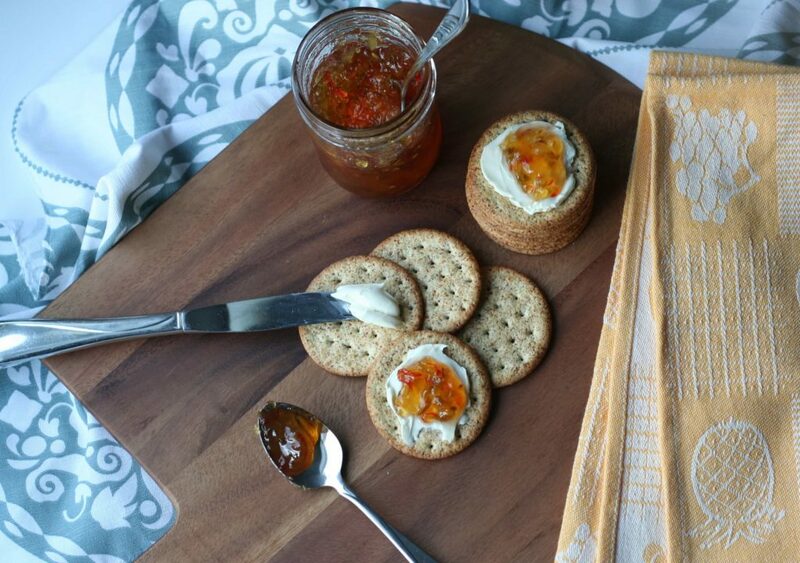 Great to spread on crackers or toast. Pinned! Thanks Mira! Hope you like it, let me know if you try it. Thanks for the pin! The jelly sounds amazing! I have never actually tried jalapeno jelly before, sounds very interesting! Thanks Manali! It is different, sort of sweet and savoury at the same time. I would TOTALLY need the pineapple in there, too! I can't see myself being into Jalapeno jelly, but I love mixing pineapple with other savory and spicy flavours -- looks awesome! I know, pineapple goes so well with those spicy flavours hey? Thanks Ashley! This jelly sounds fabulous. The hint of spice with the sweet pineapple is the perfect combination. Pinning! Thanks Jen! And thanks for the pin! such a unique flavor combo! i'm totally interested i bet it was delicious! I love this, Stacey! I've never had jalapeno jelly and wasn't sure it'd be something I'd like, but THIS I would like! These flavors together sound awesome. I love canning and making jams and stuff too - I make peach and strawberry jams every summer with my Mom and Gma! :) The pop is pretty gratifying, huh? TGIF! Have a good weekend! So gratifying right?! I love it. Thanks, and have a great weekend yourself! Thanks Kelly! I totally am going to be finding excuses to put it on everything. So tasty! I'm in awe of this flavor comination, Stacey! I love that you combined jalapenos and pineapple! I'm not a huge fan of spicy things either, so this sounds like it's right up my alley. Love this! And pinned! I actually love spicy things, just never been a fan of spicy jelly, it just didn't seem right to me! But this is entirely different than the stuff you buy at the store, so much better. Thanks so much for your kind words Gayle, and for the pin! I've never gravitated toward pepper jelly either. Spicy jam, get outta here! Now I'm intrigued by a pineapple option, maybe I'll be converted too! You gotta try it Christina, you might change your mind too! I was surprised by how much I liked this! This looks so yummy! I love the spicy/sweet combo and your idea of putting it on a turkey sandwich is great! I'm going to have to make some to enjoy with my post Thanksgiving turkey! It was shockingly good on a sandwich. Who knew! Now I'm going to be putting it on everything just to see! Thanks Erin! Ooh, pineapple and jalapeño in tacos?! That sounds awesome, I've never thought of doing that. Definitely going to have to try that sometime! Thanks Dannii!